Do you remember traveling to the hills for a vacation, going to a viewpoint surrounded by valleys and shouting your name just for the thrill of hearing the hills echo it back to you? Turns out, today we might still be enchanted by the process in our day to day lives. As the world gets more and more polarized in its opinions, one of the realizations is the fact that we are becoming increasingly ensconced in our own private echo chamber. At it’s most basic level, an echo chamber is the process whereby consciously or unconsciously we end up erecting defensive walls around our opinion, so that we screen out anything to the contrary leading to our own opinion bouncing across the walls and strengthening to an extreme in our head. While today, the term is mostly used for political opinions considering the highly polarized world we seem to be inhabiting, it is true for so many things. Even at the workplace, do we surround ourselves with people bound to parrot out the same opinion or do we consciously talk to people who might sprout up a different opinion making us weigh out different angles on the same topic at hand? Today, one of the biggest recognized culprits for the unconscious echo chambers around us is social media, especially Facebook. For the unaware, Facebook follows a pretty strong algorithm of showing you on your newsfeed only those things that they believe you would like. How else do they get you to be addicted to the network by spending more and more time on their platform, consumer more advertisements and generate revenue? In the rest of the post, I will talk about my belief that we are definitely prone to echo chambers, especially on social media and how to break free of them. However, in my ode to breaking free of it, let’s talk about two contrarian angles on echo chambers here. This BBC article cites two research-backed studies to show that divergent views are indeed displayed on social media feeds. The first study was done at Oxford University whereby they analyzed the browsing history of 50,000 US-based users. I found the research findings a little too balanced for my liking. Finally, a research paper is supposed to conclude something, right? In this case, the paper uncovered evidence for both sides. Yes, social media can lead to polarization but it also increased the individual’s exposure to varied media sources. What they did clarify was that an individuals’ vast majority of online news consumption happened by visiting the home page of their favourite mainstream media, which generally presented both sides of the picture. While that research was a bit dated at 2013, Pew Research Centre in the U.S. did a similar study after the surprising election results leading to trumping of the electorate by Donald Trump. 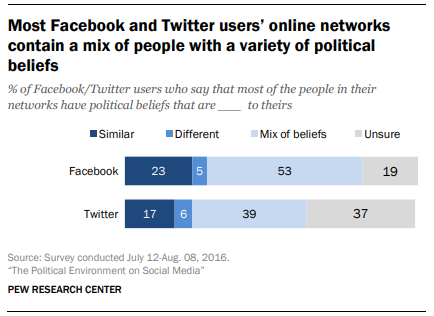 The results were interesting whereby only 23% respondents said that their Facebook network shared similar political views while 17% agreed to the statement for their Twitter network. The difference is that Facebook is generally a network of people you know, however distantly whereas Twitter is people you might be following and a result of a far more conscious choice and selection. Another interesting opinion about Echo chamber is the idea put forth by Emily Parker that echo chambers are an essential phenomenon for political activism. Where else do you have such immediate access to hundreds, thousands or even millions of people that agree with you? The key is to use social media for mobilization, not persuasion. If you look at social media as a tool to rally political activism, then, in essence, it is a speedier communication medium to beef up and drive together a singular opinion. Social media is known to have played a vital role in the Arab Spring. Had social media been there in the times of Gandhi, social media would have probably played a crucial role in mobilizing the masses and getting together a sizeable populace with the same opinion of getting freedom from the British. In essence, as per Parker, social media echo chambers are then a double-edged sword. When used for mobilization, they could be well worth the possible risk of polarization. However, what if social media is indeed promoting echo chambers around us? Ever wondered why you are nodding to so many of the things that you notice online, be it the articles posted on Facebook or even the news articles thrown by Google when you log on to the browser. While some say that the conscious decision of users like blocking unpalatable views plays a far greater role in building such echo chambers, nobody can deny the role of algorithms in our digital consumption that aid us in such endeavours. If you are still wondering why am I making such a hullabaloo about this so called echo chamber, then read for some of the risks of being trapped in one. We humans have a tendency to give in to the confirmation bias, a conscious choice to consider only such data that confirms our existing beliefs. Building such echo chambers around us only aids and enhances such tendency where we believe in something and information around us leads us to keep confirming it. Individuals empowered to screen out material that does not conform to their existing preferences may form virtual cliques, insulate themselves from opposing points of view, and reinforce their biases. Polarisation is a term to define society which is divided into two strong, extremely opposite views whereby one is not willing to see or accept any element of the other. Today, the US bipartisan democracy is often looked at as a polarized society. In fact, in the lead up to elections, Indian society seems pretty polarized to me with terminologies like “modi bhakts” and “anti-nationals”. A simpler way to see polarization is when you start looking at everything as black or white, with no shades of grey. One of the first persons to caution us to the risks of social media leading to polarization was Harvard Law School’s Cass R. Sunstein in his book #Republic: Divided Democracy in the Age of Social Media. Social media curation dramatically limits exposure to views and information that don’t align with already-established beliefs, which makes it harder and harder to find an essential component of democracy — common ground. I, myself am an opinionated person, and believe everyone is entitled to one. However, while having a personal opinion, you can still reserve empathy and tolerance for an opposing view. When you live in an echo chamber, you are deprived of any such opposing views. When you witness information only strengthening your own opinion with no visibility into any different angle, the probability of tolerance for an opposing view is bound to be limited. Although, public confession, when it comes to politics, my tolerance for views in general has gone down. So much so, that I have now banned politics as a topic of discussion with my father, whose passion for the subject has only risen post retirement. Whether you believe social media aids echo chambers or not, there is merit to taking conscious steps to break out of it, even while you retain your right to forming and holding an opinion. For me, this recommendation holds true for online and offline avenues of life. To ensure you are not in a self-built echo chamber, check for what you believe in and consciously seek out sources for information different to yours. 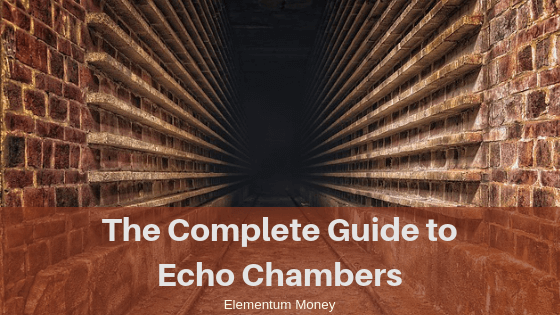 Not only will it help to balance out the unconscious environmental aids of echo chamber creation, but they are bound to broaden your horizons and enhance your spectrum. Even for something you believe in, absorbing a different opinion could help you see it in a different light or through a varied angle. This is especially true for the kind of “news articles” floating around. When we get something that we instinctively don’t believe in, we are quick to fact check. 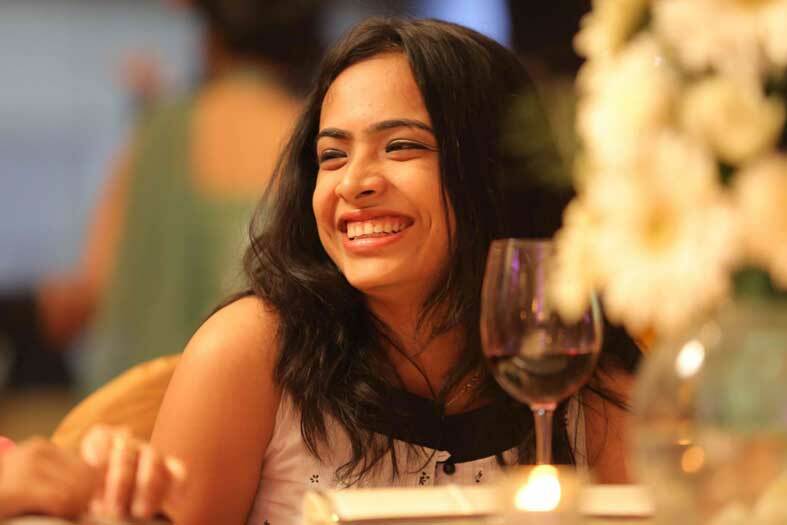 But, when it is something that fortifies our opinion, we are pretty happy to take it on face value. Make a rule for yourself to not take anything on face value. Whatever news or data you consume, try to do a quick fact check and then form an informed opinion. Technology is an epitome of being a double edged sword. While it does enhance echo chambers around us, if we so wish, there are also tools to help break it. This article helped me with three such fantastic sources. The Echo Chamber Club defines it’s purpose as “to help ‘liberals’, ‘metropolitans’ and ‘progressives’ access and understand different viewpoints and stories that don’t appear on their news feed”. I, for one, while researching for this post signed up to give their free weekly news letter a shot. While more relevant to the American political landscape, I found the idea of Escape Your Bubble google extension quite impressive. Once a user installs it and adds in their political orientation, the extension adds in news stories to their Facebook feed to balance out the view that the user gets to witness. So, what do you think? Is there an echo chamber around you? Are you taking any steps to break out of it? Let me know in the comments below. < Get your Personal Finance basics right. 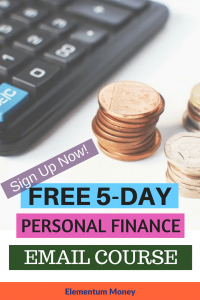 Sign up for the Elementum Money 5-day Email course for a crash course on all things Personal Finance, like Money Management, Insurance, Investments, Loans and Tax Planning. 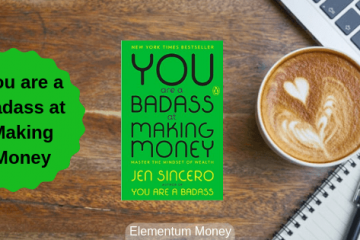 Also, get notified of all new Elementum Money posts.